Tony the Tiger (unless you count the Quaker Oats Man, who mostly just sits on the box looking pretty). And only Cap'n Crunch has any chance of being better known (and Cap's greater fame is arguable at best). Tony's purpose in life is to hawk Kellogg's Frosted Flakes (originally known as Sugar Frosted Flakes, back before sugar assumed its present position in the public consciousness as enemy of all things healthful). He's been identified with that product ever since its introduction, in 1952. He started as one of at least four spokestoons for Frosted Flakes, but Katy the Kangaroo, Elmo the Elephant and Newt the Gnu fell by the wayside early on — in fact, the latter two didn't even make it onto the cereal box. Tho Tony was originally designed by Martin Provensen, long a successful author and illustrator of children's books, it isn't his looks that have made him famous. He's been altered and re-drawn so many times, it's hard to even remember what he looked like back then. He's been a flat cut-out with a football-shaped head, a tiny thing about the size of his own illustration on the cereal box, a human-size funny animal, fearsome and tiger-like, and much more, to the point where just about any tiger-shaped toon with a red kerchief around its neck might be Tony at one or another stage of his development. No, Tony almost certainly owes his success to voice actor Thurl Ravenscroft, whose rich basso profundo "They're gr-r-r-r-reat!" is probably the longest running and most familiar slogan in the history of television advertising. It may also be the longest tenure of a single actor on any character in the history of animation. Of all Ravenscroft's many roles on radio, in Disney animated features and elsewhere, only the endless rerunning of him singing "You're a Mean One, Mr. Grinch" even remotely approaches his fame as the voice of Tony the Tiger. 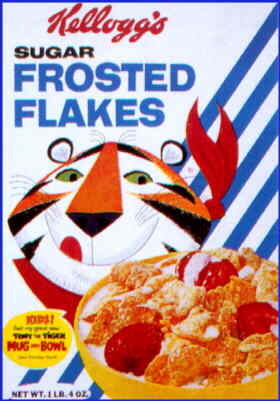 Over the years, the Frosted Flakes product has been spun off into Cocoa Frosted Flakes, Banana Frosted Flakes and a couple of other short-lived flavors, all with Tony as their spokestoon. Tony himself has been spun off, too — his son, Tony Jr., who co-starred with him in commercials as early as the 1950s, got a cereal of his own, Kellogg's Frosted Rice, in 1976, tho that one turned out not to have much staying power. Also in the 1970s, he had a wife, Mrs. Tony, and a daughter, Antoinette, tho they didn't have their own products to sell. Now in his second half-century on television, Tony the Tiger has long outlasted Big Otis (OK's), Coco the Elephant (Cocoa Krispies), Smaxey Seal (Sugar Smacks), The Wizard of Oats (All Stars) and dozens of other Kellogg Cereal spokestoons. And he shows no sign of slowing down. Text ©2002-05 Donald D. Markstein. Art © Kellogg Cereals.